Like the Dangonaronpa mobile game, Tokyo Ghoul Carnaval is billiards—billiards with superpowered, man-eating Ghouls instead of balls. Tokyo Ghoul Carnaval takes this basic formula (made popular by the iOS game Dragon Strike) and builds on it in interesting ways. There are many different characters in the game which in turn attack in many different ways. Some characters simply attack enemies they hit and then bounce off. Others can attack multiple enemies at once—launching them to bounce into other characters and receive even more damage. You are also able to bounce a character off your own characters—doing everything from healing said character to giving it an extra free attack to launch toward anyone nearby. Of course, sometimes all you do is damage your own characters when you hit them. It all depends on the special abilities of your team. Graphically, the game uses 3D models for each of the game’s characters. However, the models themselves are black, indistinct shadows—except for the investigators’ weapons/Ghoul characters’ “kagune” which glow a different color. Each specific character is identified instead by its character portrait. This allows the game to present many different characters but use the same models again and again. On the back end, it’s a pretty standard free-to-play micro-transaction game. You get new characters in the form of cards as you play and then sacrifice most of those to power up the cards of your chosen team. As usual, you are only allowed to play the game for a certain amount of time—unless you purchase more time with real world money of course. While an enjoyable enough free iOS/Android game, Tokyo Ghoul Carnaval (like most iOS games based on anime) is really just for fans of the original property. If you know nothing about Tokyo Ghoul in either its manga or anime forms, there’s little here to keep you hooked. 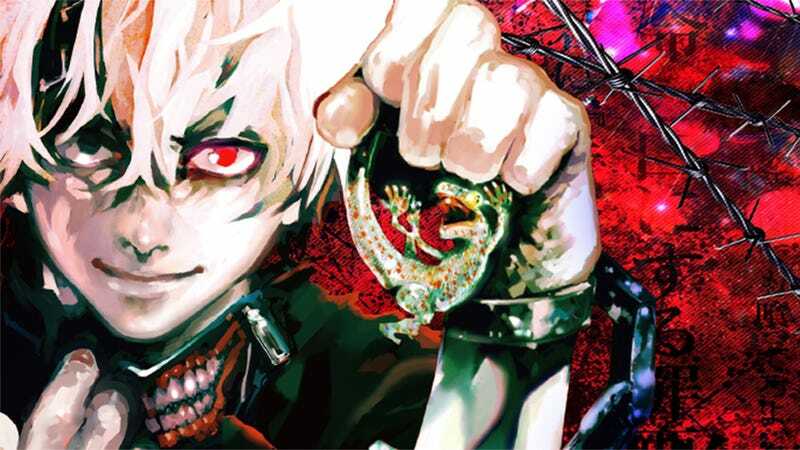 If you are a fan, however, and are jonesing for your next Tokyo Ghoul fix, this game might just take the edge off. Tokyo Ghoul Carnaval was released in Japan on February 9, 2015 for iOS and Android.